The moment we woke up today I brought Autumn to the front bay window where I always go to myself whenever it snows. There's something so dreamlike of pulling back the curtains and brightness overpowers our living room. White. Just white. The streets aren't plowed yet, the trees are literally glistening with solid snow where you can't see the bark, the cars are barely visible and little animal tracks are everywhere. I love that. I love that Autumn was with me in that moment this morning. I'm not sure what she can really see but I know she saw White. I know it made her relaxed and at ease because she was not fussing for food. She just stared out the window with me and it was so beautiful. Even though it was only for a few moments today we brought Autumn outside in the snow so she could feel a few snowflakes touch her face. 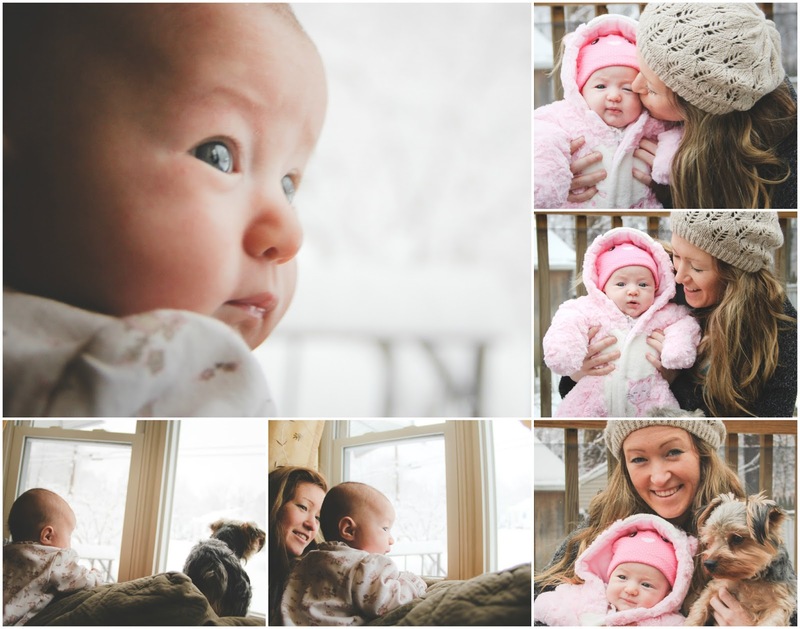 She was bundled up in a beautiful, soft, pink, fuzzy snowsuit bought by one of her Grandmas. We haven't really been outside since Autumn was born except of course the transporting from the house to the car and back again. I suppose that's the tough part with having a Fall/Winter baby. For some people they bring their babies out for walks but my anxiety wouldn't let me. Instead we stay cooped up in the house snuggling day after day until our perfect day arises and we'll give that stroller of hers a whirl! Aside from the weather my anxiety of her reflux has also caused me to stay a bit secluded in our home in all honesty. I feel she's had quite a few good days in a row now; however, her reflux and knowing some of the "epsisodes" (what I call a bad a feeding) where she screams in pain I am just not comfortable being around others. She's in pain and I don't want anyone seeing her like that, it's not fair for her either. I rather be home working on methods to make her feel better when she has everything she needs here. That's something that I'm looking forward to. Everyday that her reflux improves I feel more excited to go for visits and not have to time her feedings so we are back just in time for her to eat. Today was special. I absolutely love snow as it's so beautiful and the only excuse where I let Mother Nature cause it to be incredibly cold outside. I'm glad Autumn was able to experience her first snowfall. Next year we can play in the snow, make a snowman, fall over in a snow pile, ride on her father's back, play with Peanut and throw snowballs.